The theme for this month's Paper Smooches challenge is winter. Some of my all time favorite snowman images are from Paper Smooches, so I knew I'd need to make one the focal point of my design. I settled on the egg-shaped snowman from the classic Warm Hearts set. The image was stamped on shimmery white cardstock, then colored with Copic markers. Once the snowman was colored, I began to assemble my scene. I built it on a light blue cardstock panel embossed with a snowflake pattern. To highlight the flakes, I rubbed a shimmery white ink pad over the raised images. It's subtle, but so pretty IRL! I used a die from the Backdrop Builders set to create a snowbank to put along the bottom of the panel. To fill in the scene, I selectively stamped two of the trees from the Warm Hearts set, then colored them and cut them out. I arranged the trees and the snowman on the snowbank, using foam tape for dimension. 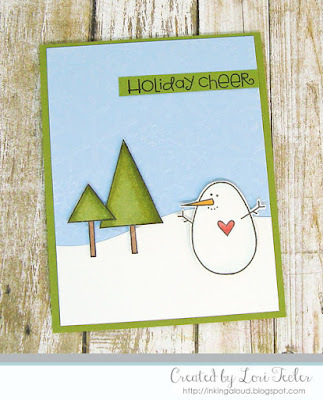 The "holiday cheers" sentiment from the Christmas Sampler set was stamped on a narrow olive cardstock strip and positioned above the images. I adhered the finished panel to an olive card base to match the sentiment strip. Love this sweet winter scene you've created Lori!